Dana Perino served as the White House Press Secretary to President George W. Bush from 2007 – 2009 – the first Republican woman to hold that position. She took over the podium from the late Tony Snow. When the administration ended in January 2009, Perino spent time volunteering at an HIV/AIDS comprehensive treatment center in South Africa. She is the president of her own strategic communications firm, Dana Perino and Company. She is a frequent public speaker on how what’s happening in Washington, D.C. is affecting people around the world. She is also a Fox NewsContributor and her commentary can be found regularly in the Washington Post, Politico and National Review. In addition, President Obama appointed her to the Broadcasting Board of Governors, the governing board of all U.S. broadcast services, including Voice of America. Perino is also the founder of “Minute Mentoring”, an organization focused on giving professional guidance to young women starting their careers. And she serves on the board of Mothers Day Every Day and Running Start. For two years before taking over the podium, Perino served as the principal deputy press secretary. Prior to that she was the director of communications for the White House Council on Environmental Quality, where she managed all energy and environmental communications. Before she joined the White House, in the wake of 9/11, Perino was a spokesperson at the Department of Justice. Altogether she spent over seven years serving in the Bush administration. Her political experience also includes working on Capitol Hill for Rep. Dan Schaefer’s (R-CO) and Rep. Scott McInnis (R-CO). She worked as a journalist before turning to politics, covering the State Assembly of Illinois for the local CBS affiliate. She also worked in public affairs in the private sector in San Diego, including for the public relations firm Porter Novelli. 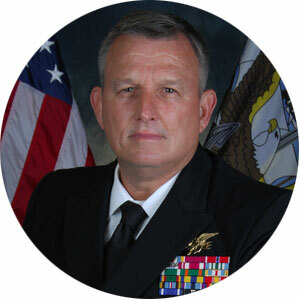 Admiral Winters is a 1979 graduate of the University of West Florida with a B.S. Degree. In 1980, he was commissioned as an Ensign through OCS at Newport, RI. Immediately after his commissioning, he attended Basic Underwater Demolition/Sea, Air, Land (SEAL) training, graduating with Class 112 in May 1981. Admiral Winters served a tour at Underwater Demolition Team 22/SEAL Delivery Vehicle Team Two, two tours at SEAL Team Four, three tours at Naval Special Warfare Development Group (DEVGRU), and multiple tours in joint Special Operations Commands. He graduated from the Naval Postgraduate School with a Master’s Degree in National Security Affairs/Special Operations and Low-Intensity Conflict. Admiral Winters has deployed to Lebanon, Bosnia-Herzegovina, Africa, Latin America, Afghanistan, and Iraq numerous times to include 8 deployments in support of Operation Enduring Freedom (OEF). His commands include SEAL Team 4, an OEF JTF, DEVGRU, the Iraqi National Counterterrorism Force Transition Team, and Naval Special Warfare Command. His decorations include the Naval Special Warfare and Naval Parachutist breast insignias, two Defense Distinguished Service Medals, Legion of Merit, three Bronze Star medals, five Defense Meritorious Service Medals, the Navy Meritorious Service Medal, and other Navy, unit, and personal citations. Upon his retirement in 2014, Admiral Winters returned to his adopted state of Florida where he and his wife, Joanna, and daughter, Hanna reside. He also has a 30 year old daughter, Gabrielle, who is working on her PHD at the University of Florida. (Ret.) CAPT Peter I. Wikul is “BULLFROG 13″, was one of the longest serving US Navy SEALS while he was active duty. Pete Wikul is the co-founder of Mission Ready, Inc. and a former U.S. Navy SEAL. Wikul has led a long and distinguished career in the military, earning the title “Bullfrog 13” as the thirteenth U.S. Navy SEAL to be honored as the longest serving SEAL on active duty (39 years). He was born May 6th, 1952 in Manhattan, New York, and enlisted in the Navy in May 1970. Soon after he volunteered for the Underwater Demolition Team (UDT) / Sea Air and Land (SEAL) program and graduated UDTB Class 7102, the last east coast UDT/SEAL training class. He served at UDT Twenty ONE and later SEAL Team TWO before selection to Officer Candidate School, Newport, Rhode Island. Upon commissioning he returned to Naval Special Warfare, completing tours at: SEAL Team ONE, UDT ELEVEN (re-designated as SEAL Team FIVE during his tour), United Nations Military Observer Group Palestine (observer Group Lebanon), SEAL Delivery Vehicle TWO, Special Boat Unit TWENTY, Naval Special Warfare Center, Special Boat Unit TWELVE, the Joint Staff, Special Operations Command South, and the Office of Naval Intelligence. CAPT Wikul served as the Deputy Commander for SOCSOUTH and Commanding Officer for SEAL Delivery Vehicle TWO. He was the commanding officer and plank owner (founding member) of the Kennedy Irregular Warfare Center, Office of Naval Intelligence in Washington, D.C. His awards include the Defense Superior Service Medal, the Legion of Merit with gold star, and numerous other personal and campaign medals. In addition, CAPT Wikul shares the 1988 Nobel Peace Prize as one of the few United Nations Observers and Peacekeepers who served in Lebanon. Prepare for total war. When called upon to fight, win. Johnny Isakson is a businessman, a public servant and family man whose common-sense approach and conservative values have made him a leader in Georgia for over 30 years. Johnny began his business career in 1967 when he opened the first Cobb County office of a small, family-owned real estate business, Northside Realty. Johnny later served as president of Northside for 20 years, presiding over the company’s growth into the largest independent residential real estate brokerage company in the Southeast and one of the largest in America. Johnny entered politics in 1974 and served 17 years in the Georgia Legislature and three years as Chairman of the Georgia Board of Education. In 1999, Johnny was elected to the U.S. House of Representatives for the first of three terms before being elected to the U.S. Senate in 2004. He was re-elected to the Senate in 2010. He has worked to strengthen our Armed Forces, and continues to show unwavering commitment to the men and women who serve our country. As a member of the Senate Committee on Veterans’ Affairs, one of Senator Isakson’s top priorities is to make sure America takes care of the veterans who have dedicated their lives to serving our country. He has seen firsthand the therapeutic effects that pets can have, and he cosponsored legislation that called for researching the potential they bring for the therapy and treatment of soldiers with post-traumatic stress disorder and traumatic brain injuries. A senior member of the Appropriations Committee, Congressman Moran Chairs the Subcommittee on the Interior and Environment and also serves on the Defense and State and Foreign Operations Subcommittees. Congressman Moran holds a leadership role in the Democratic Caucus as a member of the House Democratic Steering and Policy Committee. He is a Co-Chair of the Task Force on Trade for the New Democrat Coalition, a group he helped found in 1997. Further, Jim also serves as Co-Chair of the Congressional Prevention Coalition and heads the Task Force on Sovereign Wealth Funds, which was established to study issues surrounding sovereign wealth funds and their potential to affect geopolitics and the U.S. and international economies. Throughout his two decades of service, Congressman Moran has demonstrated vigorous leadership in support of regional transportation solutions, the environment, women’s issues, technology, fair and open trade, and fiscal discipline. He is also well known for his efforts to protect federal employees and military retirees. He co-chairs the Congressional Prevention Coalition Caucus, the Task Force on Sovereign Wealth Funds and is active on human rights issues, particularly involving women in the developing world. In the mid-1990′s, Congressman Moran co-founded the New Democratic Coalition, a group of approximately 75 middle of the road House Democrats committed to fiscal responsibility, free and fair trade, technology, and maintaining America’s security and economic competitiveness. Congressman Moran has been named “High Technology Legislator of the Year” by the Information Technology Industry Council for his work to avoid a Y2K computer crisis. He was named to the “Legislative Hall of Fame” by the American Electronics Association for his work on a range of technology legislation, such as digital signatures and H1B visas. As a member of the powerful Appropriations Committee, Jim has left his mark on the region by boosting investments in federal research and development, steering federal dollars to generate defense and technology jobs in Northern Virginia, advancing procurement reform, and played an instrumental role in resolving the 1991 real estate credit crunch. Throughout his public service, both at the state and national levels, Congressman Kingston has fought to lower taxes, balance the budget, and reduce government interference in our lives. A member of the House Appropriations Committee, which is responsible for deciding how the federal budget is spent, Congressman Kingston serves on the Defense Subcommittee which oversees all military-based funding. With the First District home to: Moody AFB, Ft. Stewart, Hunter Army Airfield and Naval Submarine Base Kings Bay, Congressman Kingston has a special interest in America’s defense abilities. Appointed as the Ranking Member on the Appropriations Committee’s Agriculture Subcommittee in 2007, he maintains a close relationship with Georgia’s farmers and has been one of their strongest allies in Washington. Prior to serving in Congress, Mr. Kingston sold agribusiness insurance. Congressman Kingston’s down to earth style and common sense approach to issues has made him one of the strongest communicators in Congress. He is often a guest on network television shows such as Fox News, MSNBC, the Daily Show, Red Eye, the Colbert Report and Real Time with Bill Maher. His conservative track record has won him recognition and awards from many non-partisan citizens’ groups and media outlets. Congressman Kingston has been rated as the “most conservative member of the House” by National Journal for his voting record. Further, he has been named each term as a “Taxpayer’s Hero,” and “A Guardian of Small Business.” Congressman Kingston was also awarded the “Watchdog of the Treasury Award,” and the U.S. Chamber of Commerce’s “Spirit of Enterprise” Award. Congressman Kingston was born in Bryan, Texas, and lived briefly in Ethiopia before moving to Athens, Georgia, where he grew up. After graduating from the University of Georgia, Congressman Kingston moved to Savannah. Congressman Kingston still resides in Savannah with his wife, Libby. They have four children, two dogs and two cats. Congressman Kingston joined the C4H Leadership Council in September 2010. Since taking office in 2005, U.S. Rep Russ Carnahan has worked to help families and businesses throughout the greater St. Louis region by supporting strong economic development, encouraging innovation and preserving national security through greater international engagement. Carnahan serves on the Transportation and Infrastructure Committee, the Veterans Affairs Committee, and is Ranking Member on the Foreign Affairs Subcommittee on Investigations and Oversight, where he has called for a strict accounting of the rebuilding efforts in Iraq and Afghanistan. Carnahan has promoted the St. Louis region as a hub for innovation, particularly in developing new, clean sources of energy that will create new jobs, cut energy costs for families and business, and reduce our dependence on foreign oil. Russ Carnahan’s advocacy helped establish St. Louis-based Donald Danforth Plant Science Center as the lead institution in a national project to develop biofuels technology. And Carnahan’s Energy Innovation Hub legislation will help develop transformational energy technologies by helping research institutions, private industry and federal agencies collaborate to move technological breakthroughs from the research and development phase to the market. A lifelong Missourian, Russ Carnahan was born on July 10, 1958 and grew up in Rolla, Missouri. Carnahan learned the value of hard work and public service from his family and the rural community where he was raised. Congressman Carnahan now lives in St. Louis with his wife, Debra Carnahan. They have two sons, Austin and Andrew. Steven Thorp, Ph.D. is an Assistant Professor of Psychiatry at the University of California, San Diego (UCSD) and Program Director of the Posttraumatic Stress Disorders Clinical Team at the VA San Diego Healthcare System. He is also the Co-Director of the Psychotherapy Unit in the Center of Excellence for Stress and Mental Health. Dr. Thorp earned his doctorate in Clinical Psychology at the University of Nevada, Reno and completed postdoctoral research fellowships in geriatric psychiatry at Duke University Medical Center and at UCSD. He conducts research and psychotherapy with veterans who have experienced psychological trauma. Dr. Thorp has a particular interest in the investigation of empirically-based psychotherapies for chronic posttraumatic stress disorder (PTSD) for older adults. Current projects include the use of video telemedicine technologies to improve access to care for veterans with PTSD and a comparison of different psychotherapies for older combat veterans with PTSD. Dr. Thorp is also investigating the role of cognitive functioning on clinical outcomes for veterans with PTSD. COL Ritchie just concluded five years as the Director of the Proponency of Behavioral Health at the Office of the US Army Surgeon General. She has held numerous leadership positions within Army Medicine, to include the Psychiatry Consultant. She trained at Harvard, George Washington, Walter Reed, and the Uniformed Services University of the Health Sciences, and has completed fellowships in both forensic and preventive and disaster psychiatry. She is a Professor of Psychiatry at the Uniformed Services University of the Health Sciences. An internationally recognized expert, she brings a unique public health approach to the management of disaster and combat mental health issues. Her assignments and other missions have taken her to Korea, Somalia, Iraq, and Cuba. She has over 150 publications, mainly in the areas of forensic, disaster, suicide, ethics, military combat and operational psychiatry, and women’s health issues. Major publications include “The Mental Health Response to the 9/11 Attack on the Pentagon”, “Mental Health Interventions for Mass Violence and Disaster” and “Humanitarian Assistance and Health Diplomacy: Military-Civilian Partnership in the 2004 Tsunami Aftermath”. She is currently the senior editor on the forthcoming Military Medicine Textbook on Combat and Operational Behavioral Health, the Textbook of Forensic Military Mental Health, and the Therapeutic Use of Canines in Army Medicine. Dr. Noelle Berger is a counseling psychologist working on the CWT/SE/Polytrauma Team at the James J. Peters VAMC in the Bronx. In this role she provides vocational counseling and assessment, psychotherapy and biofeedback to veterans who have been diagnosed with Traumatic Brain Injury (TBI), Posttraumatic Stress Disorder (PTSD), and other medical issues. Her goal in this role is to assist veterans with community reintegration issues. Prior to this role, she worked as a psychologist in private practice, at The Epilepsy Institute, and NYU Medical Center. She received her Ph.D. in Counseling Psychology from the University at Buffalo, SUNY and her B.S. from Cornell University.